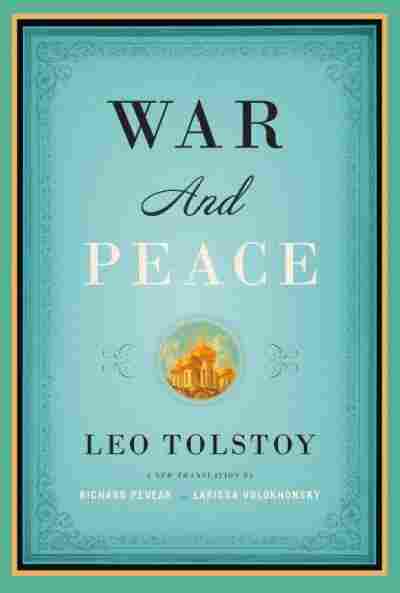 War and Peace NPR coverage of War and Peace by Leo Tolstoy, Richard Pevear, and Larissa Volokhonsky. News, author interviews, critics' picks and more. The monumental Russian classic reflecting the life and times of Russian society during the Napoleonic Wars comes to life in a compelling new translation that is faithful to the original text and accompanied by an index of historical figures, textual annotations, a chapter summary, and an informative introduction. 50,000 first printing. At eight o’clock Kutuzov rode to Pratz at the head of Miloradovich’s fourth column, the one which was to take the place of the columns of Przebyszewski and Langeron, which had already gone down. He greeted the men of the head regiment and gave the order to move, thus showing that he intended to lead the column himself. Having ridden to the village of Pratz, he halted. Prince Andrei, one of the enormous number of persons constituting the commander in chief’s suite, stood behind him. Prince Andrei felt excited, irritated, and at the same time restrainedly calm, as a man usually is when a long-desired moment comes. He was firmly convinced that this was the day of his Toulon or his bridge of Arcole. How it would happen, he did not know, but he was firmly convinced that it would be so. The locality and position of our troops were known to him, as far as they could be known to anyone in our army. His own strategic plan, which there obviously could be no thought of carrying out now, was forgotten. Now, entering into Weyrother’s plan, Prince Andrei pondered the possible happenstances and came up with new considerations, such as might call for his swiftness of reflection and decisiveness. Prince Andrei could not look with indifference at the standards of the battalions going past him. Looking at a standard, he thought: maybe it is that very standard with which I’ll have to march at the head of the troops. By morning the night’s fog had left only hoarfrost turning into dew on the heights, but in the hollows the fog still spread its milk-white sea. Nothing could be seen in that hollow to the left, into which our troops had descended and from which came the sounds of gunfire. Over the heights was a dark, clear sky, and to the right–the enormous ball of the sun. Far ahead, on the other shore of the sea of fog, one could make out the jutting, wooded hills on which the enemy army was supposed to be, and something was discernible. To the right the guards were entering the region of the fog, with a sound of tramping and wheels and an occasional gleam of bayonets; to the left, beyond the village, similar masses of cavalry approached and disappeared into the sea of fog. In front and behind moved the infantry. The commander in chief stood on the road out of the village, letting the troops pass by him. Kutuzov seemed exhausted and irritable that morning. The infantry going past him halted without any command, apparently because something ahead held them up. “I intended to form them up outside the village, Your Excellency,” said the general. An Austrian officer in a white uniform with green plumes on his hat rode up to Kutuzov and asked on behalf of the emperor whether the fourth column had started into action. Prince Andrei had only just started when he stopped him. “Et demandez-lui si les tirailleurs sont postés,” he added. “Ce qu’ils font, ce qu’ils font!” he said to himself, still not answering the Austrian. Prince Andrei galloped off to carry out his mission. Overtaking all the advancing battalions, he stopped the third division and ascertained that there was in fact no line of riflemen in front of our columns. The regimental commander of the front regiment was very surprised by the order conveyed to him from the commander in chief to send out riflemen. The regimental commander stood there in the full conviction that there were more troops ahead of him, and that the enemy was no less than six miles away. In fact, nothing could be seen ahead but empty terrain sloping away and covered with thick fog. Having ordered on behalf of the commander in chief that the omission be rectified, Prince Andrei galloped back. Kutuzov still stood in the same place and, his corpulent body sagging over the saddle in old man’s fashion, yawned deeply, closing his eyes. The troops were no longer moving, but stood at parade rest. “Very good, very good,” he said to Prince Andrei and turned to a general who stood there with a watch in his hand, saying it was time to move on, because all the columns of the left flank had already descended. “We still have time, Your Excellency,” Kutuzov said through a yawn. “We have time!” he repeated. Just then, from well behind Kutuzov, came shouts of regimental greetings, and these voices began to approach quickly along the whole extended line of the advancing Russian columns. It was clear that the one being greeted was riding quickly. When the soldiers of the regiment Kutuzov was standing in front of began to shout, he rode slightly to one side and, wincing, turned to look. Down the road from Pratz galloped what looked like a squadron of varicolored horsemen. Two of them rode side by side at a great gallop ahead of the rest. One, in a black uniform with white plumes, rode a bobtailed chestnut horse, the other, in a white uniform, rode a black horse. These were the two emperors with their suite. Kutuzov, with the affectation of a frontline veteran, ordered his standing troops to “attention” and, saluting, rode up to the emperor. His whole figure and manner suddenly changed. He acquired the look of a subordinate, unthinking man. With affected deference, which obviously struck the emperor Alexander unpleasantly, he rode up and saluted him. The unpleasant impression, like the remains of fog in a clear sky, passed over the emperor’s young and happy face and disappeared. He was somewhat thinner that day, after his illness, than on the field of Olmütz, where Bolkonsky had seen him for the first time abroad, but there was the same enchanting combination of majesty and mildness in his beautiful gray eyes, and the fine lips had the same possibility of various expressions, with a prevalent expression of good-natured, innocent youth. At the Olmütz review he was more majestic; here he was more cheerful and energetic. He was slightly flushed after galloping two miles and, reining in his horse, gave a sigh of relief and looked around at the faces of his suite, as young, as animated as his own. Czartoryski and Novosiltsev, and Prince Volkonsky and Stroganov, and the others, all richly clad, cheerful young men on splendid, pampered, fresh, only slightly sweaty horses, talking and smiling, stopped behind the sovereign. The emperor Franz, a ruddy, long-faced young man, sat extremely straight on his handsome black stallion and looked around him with a preoccupied, unhurried air. He called up one of his white adjutants and asked something. “Most likely what time they started,” thought Prince Andrei, observing his old aquaintance, and recalling his audience with a smile he was unable to repress. In the emperors’ suite there were picked fine young orderly officers, Russian and Austrian, from the guards and infantry regiments. Among them were grooms leading the handsome spare horses of the royalty in embroidered cloths. As fresh air from the fields suddenly breathes through an open window into a stuffy room, so youth, energy, and certainty of success breathed upon Kutuzov’s cheerless staff as these brilliant young men galloped up. “Why don’t you begin, Mikhail Larionovich?” the emperor Alexander hurriedly addressed Kutuzov, at the same time glancing courteously at the emperor Franz. “I am waiting, Your Majesty,” answered Kutuzov, inclining deferentially. The emperor cupped his ear, frowning slightly and showing that he had not heard properly. The sovereign heard, but this reply clearly did not please him; he shrugged his slightly stooping shoulders, glanced at Novosiltsev, who stood nearby, as if complaining of Kutuzov by this glance. “We’re not on the Tsaritsyn Field, Mikhail Larionovich, where you don’t start a parade until all the regiments are assembled,” said the sovereign, again glancing into the eyes of the emperor Franz, as though inviting him, if not to take part, at least to listen to what he was saying; but the emperor Franz went on looking around and did not listen. “That is just why I do not begin, Sire,” Kutuzov said in a ringing voice, as if to forestall the possibility of not being heard, and again something twitched in his face. “I do not begin, Sire, because we are not on parade and not on the Tsaritsyn Field,” he uttered clearly and distinctly. All the faces in the sovereign’s suite instantly exchanged glances with each other, expressing murmur and reproach. “Old as he may be, he should not, he simply should not speak that way,” these faces expressed. The sovereign looked fixedly and attentively into Kutuzov’s eyes, waiting to see if he would say something more. But Kutuzov, for his part, bowed his head deferentially and also seemed to be waiting. The silence lasted for about a minute. “However, if you order it, Your Majesty,” said Kutuzov, raising his head and again changing his tone to that of a dull, unthinking, but obedient general. He touched up his horse and, calling to him the column leader Miloradovich, gave him the order to advance. The troops stirred again, and two battalions of the Novgorodsky regiment and a battalion of the Apsheronsky regiment moved on past the sovereign. While this Apsheronsky battalion was marching by, ruddy-faced Miloradovich, with no greatcoat, in his uniform tunic and decorations and a hat with enormous plumes, worn at an angle and brim first, galloped ahead hup-two, and with a dashing salute, reined in his horse before the sovereign. “God be with you, General,” said the sovereign. “Ma foi, sire, nous ferons ce que qui sera dans notre possibilité, sire!” he replied merrily, nevertheless calling up mocking smiles among the gentlemen of the suite with his bad French. Miloradovich turned his horse sharply and placed himself slightly behind the sovereign. The Apsherontsy, excited by the presence of the sovereign, marched past the emperors and their suite at a dashingly brisk pace, beating their feet. “Lads!” cried Miloradovich in a loud, self-assured, and merry voice, obviously so excited by the sounds of gunfire, the anticipation of battle, and the sight of his gallant Apsherontsy–his companions from Suvorov’s time–marching briskly past the emperors, that he forgot the sovereign’s presence. “Lads, it won’t be the first village you’ve taken!” he shouted. “We do our best, sir!” the soldiers shouted out. The sovereign’s horse shied at the sudden shout. This horse, who had carried the sovereign at reviews while still in Russia, also carried her rider here, on the field of Austerlitz, enduring the distracted nudges of his left foot, pricked up her ears at the sound of gunshots just as she did on the Field of Mars, understanding neither the meaning of the shots she heard, nor the presence of the emperor Franz’s black stallion, nor anything of what her rider said, thought, or felt that day. The sovereign turned with a smile to one of his retinue, pointing to the gallant Apsherontsy, and said something to him. Kutuzov, accompanied by his adjutants, rode at a walk behind the carabineers. Having gone less than half a mile at the tail of the column, he stopped by a solitary, deserted house (probably a former tavern), where the road forked. Both roads went down the hill, and troops were marching along both. The fog began to lift, and enemy troops could be dimly seen about a mile and a half away on the heights opposite. To the left below, the gunfire was growing louder. Kutuzov stopped, talking with an Austrian general. Prince Andrei, standing slightly behind him, peered at the enemy and turned to an adjutant, wishing to borrow a field glass from him. The two generals and the adjutants began snatching at the field glass, pulling it away from each other. All their faces suddenly changed, and on all of them horror appeared. The French were supposed to be a mile and a half from us, and they suddenly turned up right in front of us. “Is it the enemy? . . . No! . . . Yes, look, he’s . . . for certain . . . What is this?” voices said. With his naked eye, Prince Andrei saw below, to the right, a dense column of French coming up to meet the Apsherontsy, no further than five hundred paces from where Kutuzov was standing. “Here it is, the decisive moment has come! Now it’s my turn,” thought Prince Andrei, and, spurring his horse, he rode up to Kutuzov. “The Apsherontsy must be stopped, Your Excellency!” he cried. But at that same moment everything became covered with smoke, there was the sound of gunfire nearby, and a na•vely frightened voice two steps from Prince Andrei cried: “Well, brothers, that’s it for us!” And it was as if this voice was a command. At this voice everyone began to run. Confused, ever increasing crowds came running back to the place where, five minutes before, the troops had marched past the emperors. Not only was it difficult to stop this crowd, but it was impossible not to yield and move back with it. Bolkonsky tried only not to be separated from Kutuzov and looked around in perplexity, unable to understand what was happening in front of him. Nesvitsky, looking angry, red, and not like himself, shouted to Kutuzov that if he did not leave at once, he would certainly be taken prisoner. Kutuzov stood in the same place and, without responding, took out his handkerchief. Blood was flowing from his cheek. Prince Andrei forced his way to him. “Are you wounded?” he asked, barely able to control the trembling of his lower jaw. “The wound isn’t here, it’s there!” said Kutuzov, pressing the handkerchief to his wounded cheek and pointing to the fleeing men. “Stop them!” he cried, and at the same time, probably realizing that it was impossible to stop them, spurred his horse and rode to the right. A fresh crowd of fleeing men streamed past, caught him up, and carried him backwards. The troops were fleeing in such a dense crowd that, once one landed in the middle of it, it was difficult to get out. Someone shouted, “Keep going, don’t drag your feet!” Another, turning around, fired into the air; someone else struck the horse on which Kutuzov himself was riding. Extricating themselves with the greatest effort from the flow of the crowd to the left, Kutuzov and his suite, diminished by more than half, rode towards the sounds of nearby cannon fire. Extricating himself from the crowd of fleeing men, Prince Andrei, trying to keep up with Kutuzov, saw on the slope of the hill, amidst the smoke, a Russian battery still firing, and the French running up to it. Slightly higher stood Russian infantry, neither moving ahead to aid the battery, nor backwards in the direction of the fugitives. A general on horseback separated himself from the infantry and rode up to Kutuzov. There were only four men left in Kutuzov’s suite. They were all pale and exchanged glances silently. “Stop those villains!” Kutuzov said breathlessly to the regimental commander, pointing to the fleeing men; but at the same moment, as if in punishment for those words, bullets, like a flock of birds, flew whistling at the regiment and Kutuzov’s suite. The French had attacked the battery and, seeing Kutuzov, were shooting at him. With this volley, the regimental commander seized his leg; several soldiers fell, and an ensign holding a standard let it drop from his hands; the standard wavered and fell, stopped momentarily by the bayonets of the soldiers around it. The soldiers began firing without any orders. But before he finished saying it, Prince Andrei, feeling sobs of shame and anger rising in his throat, was already jumping off his horse and running towards the standard. “Forward, lads!” he cried in a childishly shrill voice. “Here it is!” thought Prince Andrei, seizing the staff of the standard and hearing with delight the whistle of bullets, evidently aimed precisely at him. Several soldiers fell. “Hurrah!” cried Prince Andrei, barely able to hold up the heavy standard, and he ran forward with unquestioning assurance that the entire battalion would run after him. And indeed he ran only a few steps alone. One soldier started out, another, and the whole battalion, with a shout of “Hurrah!” rushed forward and overtook him. A sergeant of the battalion ran up, took the standard that was wavering in Prince Andrei’s hands because of its weight, but was killed at once. Prince Andrei again seized the standard and, dragging it by the staff, ran with the battalion. Ahead of him he saw our artillerists, some of whom were fighting, while others abandoned the cannon and came running in his direction; he also saw French infantrymen, who had seized the artillery horses and were turning the cannon. Prince Andrei and his battalion were now twenty paces from the cannon. Above him he heard the unceasing whistle of bullets, and soldiers ceaselessly gasped and fell to right and left of him. But he did not look at them; he looked fixedly only at what was happening ahead of him–at the battery. He clearly saw the figure of a red-haired gunner, his shako knocked askew, pulling a swab from one side, while a French soldier pulled it towards him from the other side. Prince Andrei saw clearly the bewildered and at the same time angry expression on the faces of the two men, who evidently did not understand what they were doing. In fact, another Frenchman with his musket atilt ran up to the fighting men, and the lot of the red-haired artillerist, who still did not understand what awaited him and triumphantly pulled the swab from the French soldier’s hands, was about to be decided. But Prince Andrei did not see how it ended. It seemed to him as though one of the nearest soldiers, with the full swing of a stout stick, hit him on the head. It was slightly painful and above all unpleasant, because the pain distracted him and kept him from seeing what he had been looking at. On 17 November 1796, fighting the Austrians in northern Italy, Napoleon, at the head of his grenadier and with a banner in this hand, charged onto the bridge at Arcole to keep the enemy from taking it. The plague that was raging in Jaffa when the French stormed the city afflicted both the local population and the French army. Napoleon visited the plague victims in the hospital with his marshals Berthier and Bessières, an incident commemorated by the French painter Jean-Antoine Gros (1771-1835) in The Plague Victims of Jaffa (1804). My dear . . . the old man’s in a foul humor. Go and see, my dear, if the third division has passed the village. Tell him to stop and wait for my orders. And ask him if the riflemen are posted . . . What they’re doing, what they’re doing! A square in Petersburg used as a parade ground. In 1818 the name was changed to Marsovo Polie (“the Field of Mars”). By my faith, Sire, we will do that what which will be within our possibility, Sire!